Picked this up in a 2-for-1 craigslist trade. Few scratches from use, nothing through the finish, overall good condition. Fender’s serial number guide dates it 2002-2004, CIJ model. Been gassing for a SCPB for a while. Have never had the chance to really try one out for more than a few minutes, but I remember having picked both a Sting and a ‘51 up at various times and loved the big neck. Came set up with Chromes, included a RoadRunner hard case (as opposed to the stock gig bag) and the previous owner had cut two pickguards (BWB and Tort) in addition to the stock white. Personally, I’d want to run it without, but there’s an exposed channel for the wiring, so I’m leaving one on for now. Only real issue is that the pickup seems to be loose from the bobbin on the E string magnet. I can wiggle the pickup and it looks like the coils, magnets and the top of the pickup move, while the base of the pickup does not. When I do this, it makes a popping noise similar to if I were tapping a screwdriver on one of the magnets. I have yet to pull the pickup out to see what’s really going on or what I might possibly do to fix it. Otherwise, electronics all seem fine. Small dime-sized pots, but smooth and not scratchy. Might swap them out if I end up replacing the pickup, but probably won’t if I can/do keep the stock pickup. It was set up tuned flat, and I tune to standard, so I tuned it up and am giving it a few days to see if the tension change necessitates a setup. Intonation seems pretty close to accurate even on the 2-saddle bridge, so time will tell if that gets swapped out. And, FWIW, the “Stinglay” isn’t too bad. Kind of neat, 3D effect when you actually look at it. Doesn’t bother me. And I’m not a Sting/Police fan. Any thoughts/experience/tips for the old SCPBs would be welcome. What's the weight on your new Sting bass? I've owned two, and they were both very nice. TDR1138 wrote: Picked this up in a 2-for-1 craigslist trade. Few scratches from use, nothing through the finish, overall good condition. Fender’s serial number guide dates it 2002-2004, CIJ model. Been gassing for a SCPB for a while. Have never had the chance to really try one out for more than a few minutes, but I remember having picked both a Sting and a ‘51 up at various times and loved the big neck. Congrats on the acquisition! Just curious - what got traded away for the P? Deano wrote: What's the weight on your new Sting bass? Ken Baker wrote: Just curious - what got traded away for the P? The red parts J in my Avatar pic (I should change that) plus a parts Strat, neither of which were seeing any real play time. No G&Ls were sacrificed in the trade. After getting it tuned to pitch and letting it sit for a few days, I gave it a good setup. I didn’t have to adjust the truss rod, but I did adjust the action and intonation at the bridge. I was a little worried about getting the intonation set on the two-saddle bridge, but it wasn’t too bad. It’s still a tiny bit off above the 15th fret or so, but I’m really not playing up that high, so it’s good enough. I pulled the pickup out to see what was going on. The E-string magnet had pulled up from the base bobbin. Took 2 seconds to press it back in with some vice grips. It feels stable now, no more popping noise. I’ve read that the pickups on these can get pulled apart easily, since there are no covers, so I’m guessing that’s what happened. Quick, easy fix. The input jack was loose in the cup, too, but again, a quick fix. The jack itself is a little too smooth – i.e. I didn’t feel a “click” when the plug was all the way in, but I had no problems with contact or static. I may have an extra Switchcraft jack in the parts bin somewhere that will end up on this bass, just for peace of mind. Played it at my weekly church gig. Sound was definitely punchier and brighter than I expected, even with the Chromes on. I was expecting a little more or a thumpy, or even muddy sound, but it was pretty clear and articulate, considering that it has flats. I didn’t have any issues with hum, even though the bass has no shielding (which will be a “when I get around to it” project). I really do like the simplicity of one pickup, one volume, one tone. I think the weakest part of the bass is the tuners. They’re just stiff, not really smooth. Remind me of the tuners on an old SX I had. That said, they don’t budge, so I had no problems with it going out of tune or needing to tune up. Time will tell if I replace them, or the bridge, but I’m kind of leaning toward leaving well enough alone for now. You are lucky that the original pickup survived that e pole mishap. Usually the flatwork coming loose on these pickups is the kiss of death. 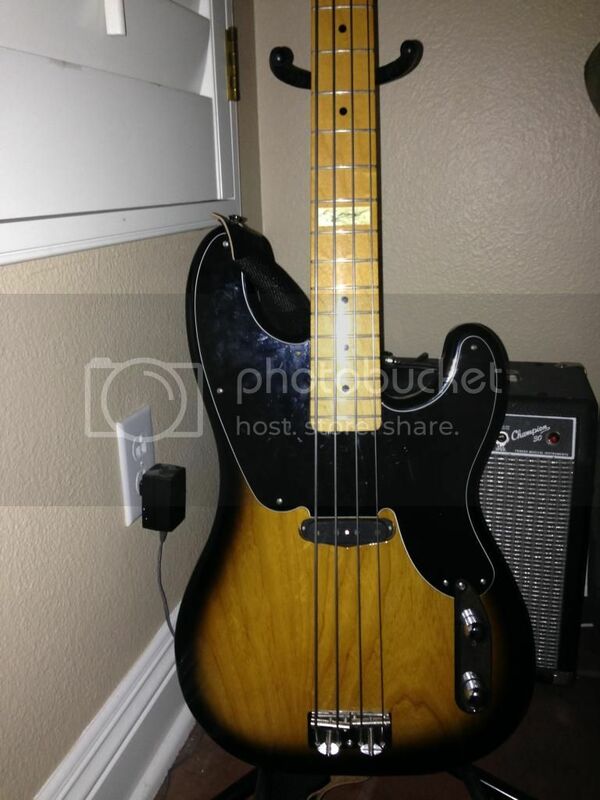 i have two of these basses and I am always impressed at how well the Japanese can make a Fender bass. Enjoy playing it. A Sting bass is a unique sound unto itself. Thanks. No issues since the repair, though I am working on the "floating thumb" technique with it, at least on the E string. I really do need some new strings, as I'm not digging the feel of the Chromes. Tone, yes, feel, not so much. I've also gone back to the original white guard, as I think it adds to the classic look. The novelty of the black has worn off. Content deleted due to contravention of Ken's rules!